I had a bit of an obsessive idea that I wanted a maxi dress for winter. That’s the thing about capsule wardrobes, you really do think through every single piece. 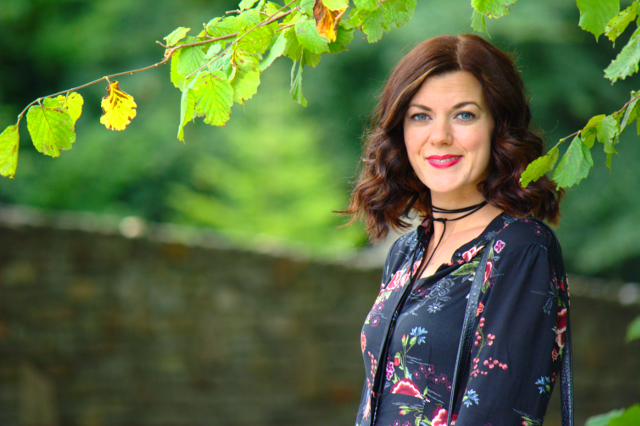 Having loved wearing maxi’s all summer, I knew I wanted to continue in that same vane and have something pretty long and floaty, but could be layered, for the colder months. Thankfully the clothing gods heard my prayers as there are a lot of wintery maxi’s on the market at the moment (post coming next week!). So i window shopped for about 2 months before finally settling on this one from Zara, and I am so glad I did because I absolutely adore it. The comfy fabric, the dark yet floral print, the button down front and the pocket(!!) all make this my absolute perfect dress. I’ve worn it a few times already and know that any ‘nice occasion’ that may arise, this will be my go-to dress. The fact that it’s comfy, hides a food baby and is flattering also makes me love it all the more. I paired it with my trusty Vegan biker jacket (that I also recently got for my capsule) by Blank denim via Shopbop..( Who incidentally have the most epic 25% off sale on at the moment, be sure to have a shop, i mean look, if you’re in the market for something as it ends very soon!) and it appears that it may have to be surgically removed from my back, as every day it is the only jacket i want to wear. I love how a biker jacket adds that little bit of ‘edgy’ to any outfit. Also the fact that its a vegan jacket also makes me love it all the more. I’m a vegan inside and out *big smiley face*. I can’t wait to remix this gorgeous dress with some thick tights, knee high boots and a big chunky knitted sweater over the top, so the dress instantly becomes a skirt. Do you own any winter maxi’s? If not would you try one? Moody floral and leather jacket is a perfect combo for cooler climates. Have a great weekend! That is a beautiful maxi dress! 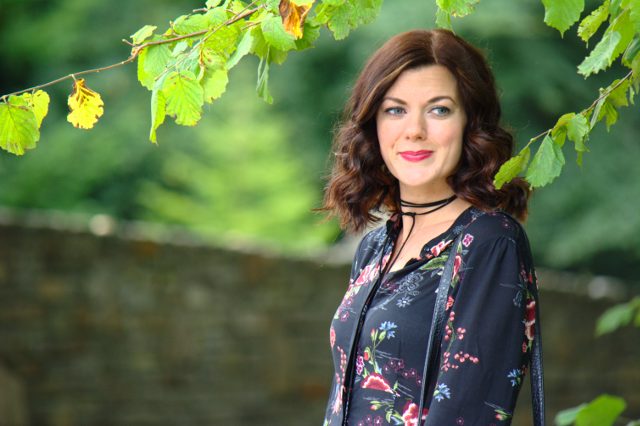 I'm a big fan of maxis (in fact today's post that I've linked up has me wearing them too haha!) and I wear them year-round, although definitely more often in warmer weather. That dress is absolutely gorgeous! I love it. I have never considered wearing a maxi in winter but this seems to me just perfect for the season. Plus it has a pocket?! Perfection. I love the jacket too. Being a vegan too, good quality biker jackets are a bit of a struggle. Thank you for showcasing this one! looooveeee the dress! the way you styled it is just perfect! I love maxi dresses, too, and just bought one for fall. Yours is gorgeous – I love the colors and the floral print! It looks great with the jacket & the boots – you look fabulous! And I can see you loving it over the next months and styling it different ways. Favorite look on you to date!!! What a beautiful dress, LOVE IT!! Yes to fall maxi dresses! I actually have two new ones I need to style for the blog. You look great and I love how you added a leather jacket! 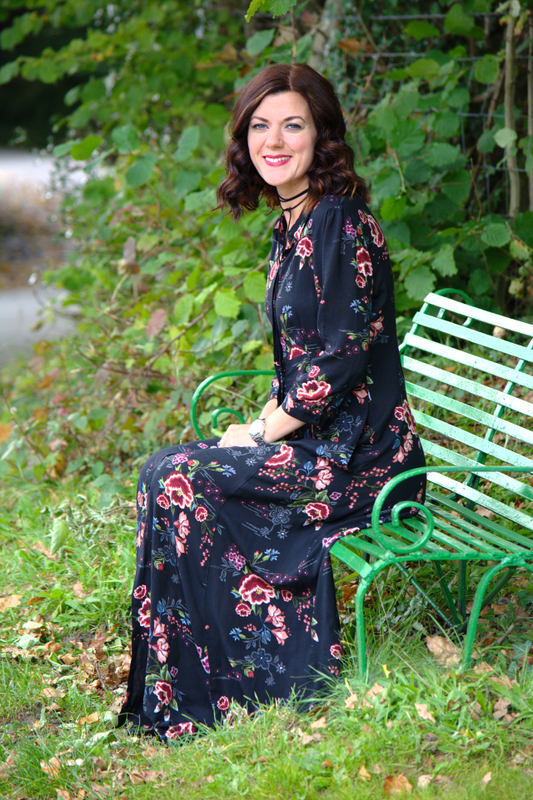 This is a great way to wear the maxi in Fall!!! Wow! You look absolutely stunning! This dress is so gorgeous and you styled it beautifully. I don't own any maxis because they just don't look good on me. They are an item that I think I enjoy looks good on everyone but me. A winter maxi wouldn't work for my climate either. Love this look & dark florals for Fall!!! Love this look! I am so on board with a winter maxi. This one is beautiful. Love how you styled it too! Such a gorgeous maxi dress! 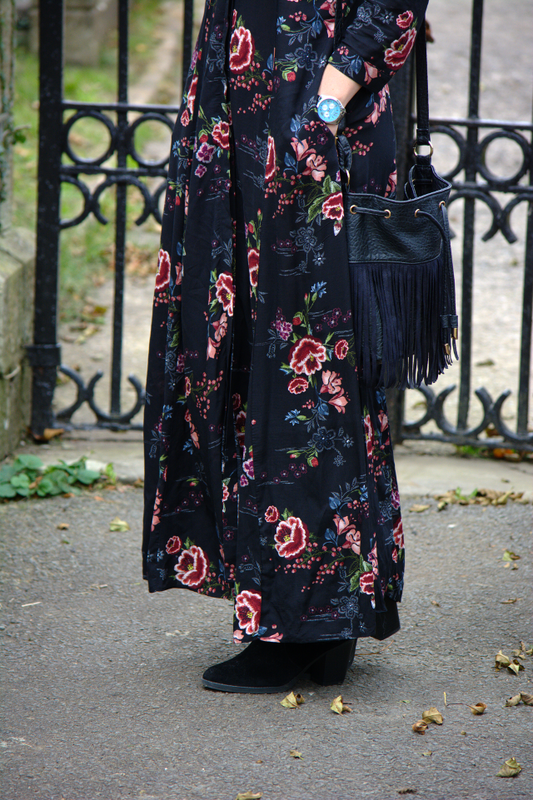 I have a similar dark floral maxi I had planned to put away, but now I am totally inspired to style it for fall and winter. Thanks! What a beautiful maxi! 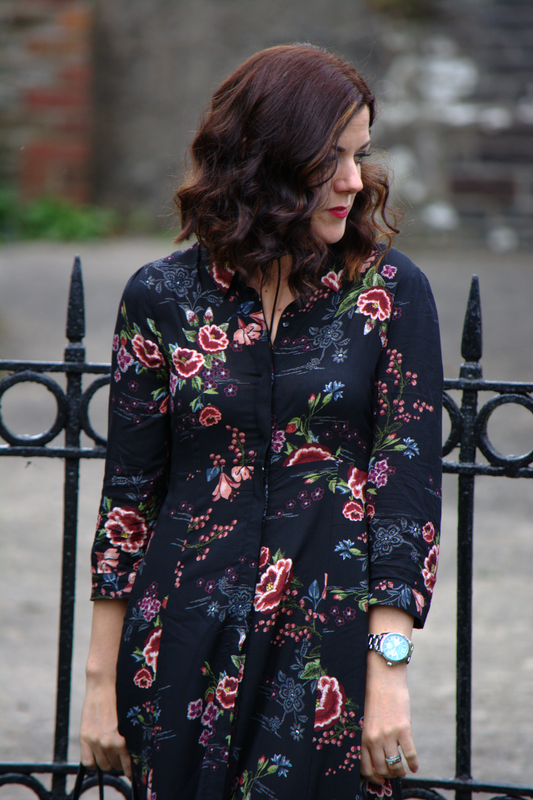 I love the dark florals for fall, and it looks great with the vegan leather! I often never thought about maxi in winter, but this one is so beautiful, makes me want to find one 🙂 I'm looking forward to seeing the next articles about winter maxi 😀 Thank you!! This is so so pretty, and so flattering on you! Haven't thought about a winter maxi, but now I'm considering it!!! Such a gorgeous floral print, perfect for fall! I love dark, moody florals for fall, and I can't wait to see all the ways you remix this dress! What a beautiful maxi! I love the colors and the slit on the front of a dress! Really pretty! Great minds think alike! I've been rocking maxis this fall too. Love how you paired this with a leather jacket! Beautiful dress! You look stunning! 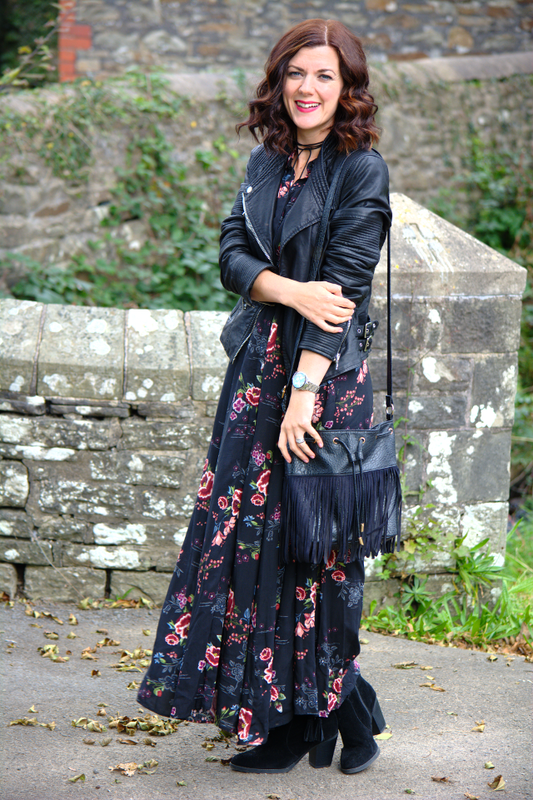 I love how you've styled it with the biker jacket and fringed bag.